“An artist photographing her child can invite ridicule.” That’s what photographer Robin Schwartz says in her artist’s statement. And ain’t it the truth. Moms with cameras. These are the people accused of being responsible for ruining the stock photography market. These are the people who caused the bottom to drop out of the child portraiture business, and who are starting to destroy wedding photography. Moms with cameras—they’re the ones who are to blame for the Cute Explosion in photography. They’re like locusts, mindlessly ruining everything serious male photographers have worked so hard and so long to create. And moms with cameras can never be real artists. At least that’s the perspective of a lot of traditional photographers. For some women, the cliché actually becomes Truth. Some women do, in fact, through the act of photographing their children, become artists and turn professional. Others, like Schwartz, were already artists and professionals who simply incorporated their new child into their art. But the cliché still tends to attach itself to women who photograph their children. And sad to say, it often does invite ridicule. But anybody who ridicules Robin Schwartz as a ‘mom with camera’ is making a huge mistake. 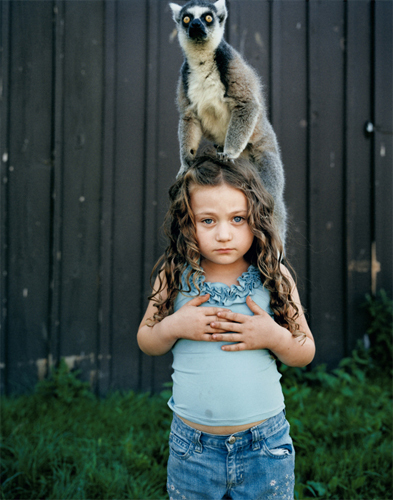 Schwartz, who earned an MFA from the Pratt Institute—one of the leading art schools in the U.S.—first garnered public attention with her 1993 series Like Us: Primate Portraits. That black-and-white portrait series featured apes and monkeys living with humans. The photographs are shot with compassion and reveal something interesting and curious both about the animals themselves and about the people who care for them. They’re quite well done and a pleasure to look at, but they don’t really contribute anything new. The same can be said of her next series, Dog Watching (1995). They’re beautifully made photographs of dogs—strays, junkyard dogs, and family pets. “I simply love dogs,” Schwarts says. “I have found great humanity, love, respect, adventure, and comfort in their company.” That love is obvious in her work, and the photographs are well worth looking at. But, again, there’s nothing new or singular about the work. But her next series, Amelia’s World marked a shift in her work. The work still concentrates on animals and the relationship humans have with them, but the newer photographs were shot in color. More importantly, the photos all have a unifying element—Amelia, Schwartz’s daughter. 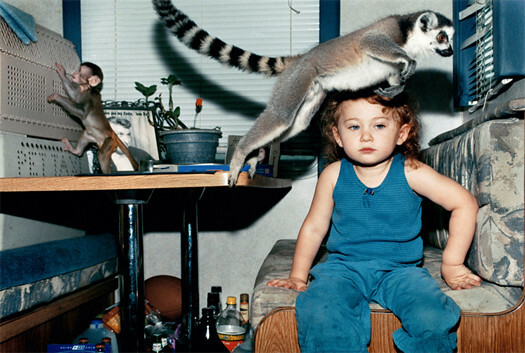 At the hands of a lesser photographer, a series of photographs of the artist’s daughter interacting with animals—could very easily have been appallingly cute and precious. That Amelia’s World is neither cute nor precious is a testament to Schwartz’s talent. Equally responsible for the success of the images is her delightfully sober-faced daughter. While the work is clearly directed and shaped by Schwartz, it’s also very obviously a collaborative process. What makes Amelia’s World such fine work is that it’s not about Amelia as Schwartz’s daughter; it’s not even really about Amelia as a distinct being, separate from her family—though that individuality is what makes the series work so well. Amelia’s World is about the interaction of that unique individual with other beings of different species. It’s the child’s singular response to those creatures that lift these photographs up. Amelia seems perfectly nonchalant about the fact that she’s among other species. 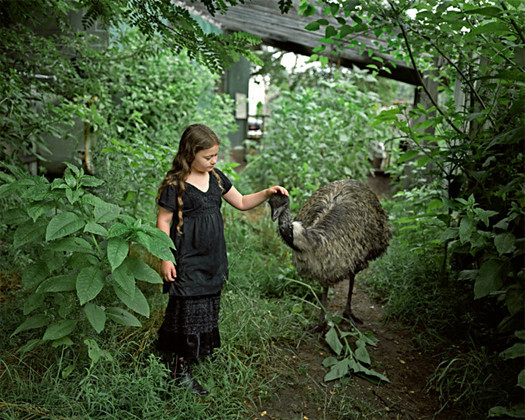 Where other children might be giddy with excitement or tentative or fearful, Amelia appears to regard those creatures as commonplace—as if there’s nothing out of the ordinary to share a table with a lemur or take a walk with an emu. The interest and affection she shows to these creatures is no different than the interest and affection she’d show to any being. 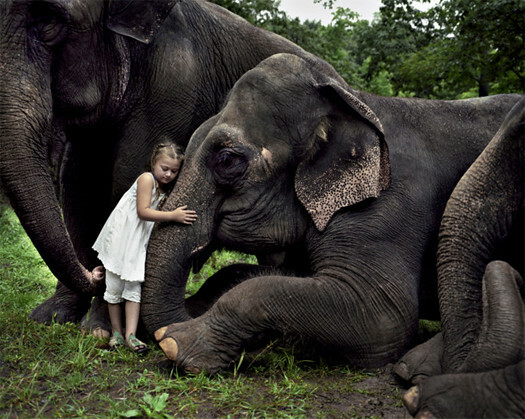 It’s not that she’s indifferent to the animals themselves; it’s that she’s indifferent to their animalness. Schwartz’s earliest photographs of Amelia with animals have an almost snapshot quality to them. They have a rather documentary quality, as if they’re completely extemporaneous and unplanned—and, indeed, they might be. But as the series progressed—and, one assumes, as Amelia’s individual personality began to assert itself—Schwartz began to create more organized and elaborate vignettes. The images continued to depict the spontaneity that’s necessarily the product any human-animal interaction, but an element of staging is clear. Schwartz sets the stage, but it’s Amelia and the animals who create the scene. That isn’t a criticism; it’s an acknowledgment of Schwartz’s progression in style. From the earlier documentary-style imagery she has evolved to a more formal and deliberate form of fine art photography. That progression not only shows more confidence by Schwartz in the integrity of the series itself, it shows more confidence in her daughter’s intuitive ability to create visually compelling moments. And Amelia comes through. In her artist’s statement, Schwartz refers to Amelia as “my priority, my muse, my co-conspirator, my tormentor and my bliss.” To my ear, that sounds more like the mother speaking than the artist, but it’s also clear that Amelia has indeed acted as a sort of muse. The child has obviously been a source of inspiration to the mother. That’s not unique, of course—children often inspire their parents—but it’s rare to see something so original born out of that inspiration. Schwartz has done an amazing thing with Amelia’s World. She’s had the courage to occasionally step outside of her role as mother. I suspect she’s received some criticism for that. One wonders how long that special collaboration between Amelia and her mother will last. As children grow older, they become less spontaneous; as Amelia matures she’ll become more ‘human’ and even if she retains that same casual nonchalance around animals, she’ll almost certainly lose the innocence of her interactions with them. It will be interesting to see where Robin Schwartz’s photography will go when that happens.